Available on GSA Program Pricing - Call or Request Quote! High security document destruction is simple with an NSA Approved cross cut shredder! An automatic oiler makes for easy maintenance and longevity of your investment! 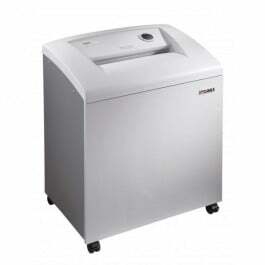 Dimensions (h x w x d) 34 1/4" x 21 1/2" x 17 1/8"
Dahle's 40334 Small Office Shredder is built with a 10 1/4" feed opening to accommodate both letter and legal size paper with ease. This cross cut machine offers a 1mm x 4.7mm particle size and is able to shred to security level P-7 standards. State-of-the-art features included with the Dahle 40334 shredder save you time and take the burden out of shred­ding your documents. Built in EvenFlow Lubrication System evenly lubricates the cutting cylinders reducing the risk of a paper jam. Automatic On/Off operation uses an electronic sensor to turn the machine on. All you have to do is position your document in the feed opening and the shredder will take care of the rest. Bag Full Auto Off is another con­venient function that notifies you when the shred bag is full and needs to be changed. All Dahle Small Office shredders come equipped with the revolutionary SmartPow­er Energy Management System. This multi-stage system reduces power consump­tion after ten minutes of sitting idle (sleep mode), and completely powers down after an additional 20 minutes of inactivity. Dahle SmartPower will appeal to those interested in conserving energy as well as reducing electrical costs. Dahle’s shredders are German Engineered using the latest technology and finest ma­terials. The end result is a quality machine and peace of mind in knowing your Dahle shredder will provide many years of trouble free operation.